Members of the press and local fire station gathered in Chicago to learn a few things about taking the Volt apart. First responders, need to learn valuable information that will help them save lives during emergencies. High strength steel and complex electrical systems make disassembling the Volt more difficult than older vehicles. 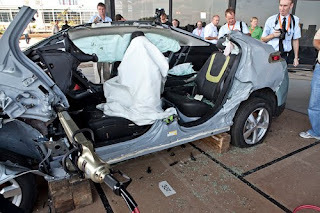 Though the Volt packs a rather large electric battery and there is the chance of electrocution, knowing the vehicle makes this risk is relatively low. Its pretty amazing what these hydraulic cutters can do to these vehicles!